Wunderino - Read this review before registering! Registration is done in several simple steps. First you will need to enter your e-mail address and then choose a password. The next step is to enter your mobile number. This is important because the casino will send you an activation code via sms. After that, you must enter further information about your name and place of residence. This process was simplified through the use of a database of addresses. You can then complete the registration by entering the activation code. If you do not want to receive text messages from the casino, you will need to contact customer support, who will then delete you from the mailing list. As a new player, you will be greeted at Wunderino with a very generous bonus offer that you can get on the first three deposits. For the first deposit there is 400% up to €40, for the second deposit 100% up to €200 and for the third deposit 50% up to €500. On the first deposit, there are also 30 free spins to play on NetEnt's Slots Lights, Starburst, or Aloha. These free spins will be credited to you over the following three days, 10 games per day. These free spins are valid for 24 hours and if you do not play them then they will expire. To get the free spins you have to activate them in the section "My Bonus". If you get bonus money from the casino then this is also tied to certain conditions. You must wager the bonus plus the deposit at least 30x. A bonus is valid for 30 days, and if you fail to meet the wagering requirements during this period, the bonus is forfeited. When you play with the bonus money you should also note that different games contribute differently to the wager requirements and only slots, classic slots, keno and triple wins contribute 100%. Table games, poker and video poker do not contribute towards the requirement, while the other games Dead or Alive, Book of Dead and Bloodsuckers contribute 50%. There are some games that are also completely excluded and more information can be found in the bonus conditions on the website. There are also maximum bet limits of €5 per spin or €0.50 per line. We recommend that you read the bonus terms well before playing. On the bonus terms I would like to mention that these are slightly more favourable than in other casinos, as you can get a lot of bonus money. If you have successfully activated your player account, you can make a deposit and start playing. Click on the button labelled "Deposit". Depending on the country in which you have registered you have different deposit methods available, which you can then see. If you want to receive a bonus, you can tick the box. The website is secured with SSL and all transactions are made only over encrypted connections. When I made my first deposit, I used a credit card and after following the instructions for deposits on the website, it only took a few seconds for the amount to be credited to my gaming account. After that I could start playing immediately. Currently you will find the following game providers: Netent, Play'n GO, NextGen Gaming, 1x2Gaming, Thunderkick, Elk Studios, Microgaming, Endorphin, Booming Games, EGB, EGT, Evolution Gaming, Genii, Habanero, JoinGames, Lega, Mrslotty, Multislot, Nolimitcity, NYX Gaming, Oryx, Pariplay, Playson, PragmaticPlay, Quickspin, Williams Interactive and Yggdrasil. You may already know some of these developers as they are some of the largest in the industry such as NetEnt, Play'n GO, Microgaming, EGT and Nyx Gaming. At the same time, there are also some smaller providers, such as Quickspin or Pariplay, that have already made a name for themselves in players' eyes. In the game selection you can find popular games like Starburst, Big Blox, Medusa II, Sticky Bandits, Immortal Romance, Jumanji and Ramses Book, as well as hundreds more games based on just about any motif. The casino also offers some interesting jackpot slots, including Mega Moolah, Divine Fortune, Mega Moolah Isis and Major Millions, where you can win huge progressive jackpots. Unfortunately, there are currently no big NetEnt network jackpots. You are also granted access to the Evolution Live Casino where you can find different variants of roulette, blackjack, baccarat, casino poker and other games that you can play against real dealers. If you prefer the online versions of the games, you can also find many online table games, not just roulette and blackjack, but also many video poker and dice games. The website is also optimized for mobile use and you can play a wide range of games on smartphone and tablet computers running iOS, Android or Windows Phone operating systems. Again, the navigation of the website is quite simple, but there is some room for improvement. The website is very nice in itself, but it is not always very intuitive. Although the games are divided into different categories, it is somewhat difficult to find individual games and the search function does not always work. The categories include slots, top lists with favourites, popular and new games, live casino, jackpots, classics and table games. 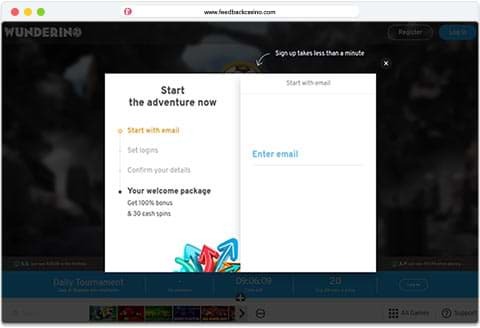 Once you have registered and logged in, you can access your player account at the top of the menu. Unfortunately, the design could also be a bit clearer, because only under the Hamburger menu will you will find more information about your player account. However, it is generally easy to make deposits and you can also see how much credit you have to play with. An important aspect of an online casino is customer service. Of course, as a player you would like to get help quickly when you need it or get answers to questions. At Wunderino, customer support can be obtained by email or live chat. Unfortunately, this means that there is no telephone number, which I personally find a pity, as I like talking to staff on the phone to resolve a problem quickly. A good alternative is the live chat. Customer service is also not available around the clock so you can only reach the staff between 8:00 and 12:00 midnight. As long as you are not a night owl, that should not be a problem. On the positive side, however, it should be noted that the customer service puts a lot effort into answering questions and is very friendly. Staff also speak different languages, including English and German. When you play at Wunderino, you automatically participate in the loyalty program. You will be rewarded every time you play. Depending on how much you play, there are more and better deals, including promotions, daily contests and other surprise offers. If you are one of the very special players who play very often, then there are even more benefits such as personal contact with the casino, higher deposit limits and cashback rewards. The promotions change every week, so it's always worthwhile to stop by the casino to check out what is on offer. However, what is very interesting here are the missions that you can fulfil while playing and allow you to ascend to a new level. It works like this: in a certain period of time, called season, you have to complete missions and climb up the levels before the season is over. A season can vary in length: a few days or a month. The winners of a season are rewarded with great prizes, which also differ in the seasons. The current prizes and details can be found on the website. The missions can be very different and they will be displayed on the website. 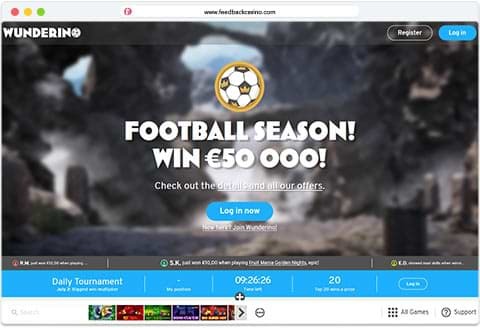 There are also daily tournaments at Wunderino where you can participate and then fight against other players on a leaderboard for the best seats. This system of missions and tasks makes playing in the casino even more interesting, because you will be rewarded almost twice. There are many different methods of making a deposit or withdrawal of money into or from your player account. These include Sofort, PayPal, Visa, Mastercard, EcoPayz, Zimpler, Paysafecard and bank transfers. There are no fees for a deposit or withdrawal, but there are different deposit limits, which are higher if you are a VIP player. With payouts, it is positive to note that the casino tries very hard to pay the money as soon as possible, usually within 24 hours, if you send the request on a working day. However it ultimately depends on the payment method which determines how fast you will receive your money, because a payment on credit cards or a bank transfer can take several days for you to get the money. It may also be the case that the casino asks for confirmation of your identity before a withdrawal is made. In that case, you will need to provide the casino with your documents in the form of a scan or photo of your ID card or passport and proof of address. These reviews are required by the regulator and are designed to prevent money laundering or other fraud. Once your player account has been verified by the casino, nothing stands in the way of the payout. Generally speaking, Wunderino Online casino is a good casino with more pros than cons which works will in its favour. The casino has made to include a range of games allowing every player to find what they're after. The game filter could be a little bit as I did find it difficult to find games. Still, I did enjoy the missions and the adventures, which is a good opportunity to win even more money. Players eager for a lot of bonus money here will be rewarded here, but pay attention to the slightly higher bonus conditions. In contrast, the free spin prizes are free of requirements. Customer service is not available around the clock, and there is no phone support but you will find that the staff are very friendly and happy to help. add_circle Lots of games to choose from and that I can play on my tablet when I'm abroad on business and need a pick me up. So far my experience has been positive and the person I spoke to on the live chat was very helpful. add_circle I decided that I would give Wunderino a try as the reviews have been pretty decent. They have 100% welcome bonus which decided to opt in four. It was capped at 100 which I think is normal and I had to make a min deposit to get started. I got 30 free spins which i used on Starburst but I had to use them over three days. I looked at the t & c after I signed up but should have looked closer. I had to wager the bonus + the deposit 30 times before I could withdraw my winnings. By the time I satisfied the requirement there wasn't much left to withdraw unfortunately. add_circle Wunderino has a lot of games to choose from so I never get tired of playing. I stick mostly to slots and the good thing is that you can do a search on say a developer to list all the games which makes it easy to scroll through. I'm still waiting for the big win though. add_circle I'm a big fan of live dealer black jack and have no complaints. They also have baccarat, poker and roulette but I stick with what I know mostly. I've also played the online black jack games which I enjoy. I would recommend them for tables games and live dealer. -can't pick up the phone to call them as there is no telephone support. Live chat is helpful though but it is not 24/7 if you play outside supported hours. -games are sorted into categories including jackpots, slots, table games, etcetera. remove_circle I hope to see Betsoft added in the future as they have some great 3D slots. add_circle I recently setup an account at Wunderino and one of the reasons I decided to try them was because of the number of developers that you can find there. Their website says 18, but really I am mostly interested in my favourites: Netent, Microgaming and Play'n Go! Overall – great casino! add_circle I have been playing on Wunderino for a while now and enjoy taking part in the odd tournament. One of the "pros" of the Feedbackcasino website said that there is no deposit fees which I confirm. The games work fine on my mobile and have dound customer care to be friendly and supportive. add_circle great customer support - registered quickly – plenty of games to choose from. I have no complaints so far!